Chapter 102 opens hopefully as Alexander makes peace with a few tribes but then becomes a tale of blood shed – one conquest after another as Alexander continues his journey to the ocean. The Sambastae lived in cities that were ‘governed in a democratic manner’. Their army comprised of ‘sixty thousand infantry, six thousand cavalry, and five hundred armoured chariots’. I don’t know how large the Macedonian army was at this point, but it seems that the Sambastae was organised and had sufficient numbers to put up a good defence of their country. They were compromised, however, by two things. (i) An unfamiliarity with ships. When they saw the Macedonian fleet approach, they were taken aback by it. (ii) A knowledge of the Macedonian army’s reputation. If only the Sambastae had been ignorant of the Macedonian army’s achievement they might have recovered enough to fight. As it was, the tribal elders advised the authorities ‘not to risk a fight’. Unlike the young Marmarians (read here) the rulers of the Sambastae agreed, and they sent ‘fifty of their leading citizens’ to beg for their lives. The ploy worked. Alexander ‘praised them and agreed to a peace’. In return, he was given ‘large gifts and heroic honours’. These two tribes lived on either side of the Indus River and submitted to Alexander, as it seems, without a fight. Alexander built a new Alexandria in or near these tribes’ territory. Ten thousand people were settled in it. We are not told whether there was a battle or if Musicanus gave himself up or was kidnapped; however, by some means or another, Alexander caught and executed him. In so doing he made Musicanus’ country subject to himself. There was definitely fighting here. Diodorus says that two cities in Porticanus’ country were taken ‘by storm’. Afterwards, Alexander gave his men permission ‘to plunder the houses, and then set them on fire’. As for Porticanus, he managed to escape to a stronghold only to be killed when Alexander attacked it. Alexander was not done with Porticanus’ territory yet. He captured all ‘the other cities of [Porticanus’] kingdom and destroyed them’. Diodorus says that Alexander ‘ravaged’ Sambus’ kingdom, killing eighty thousand people and destroying his cities. Most of their populations were taken into slavery. 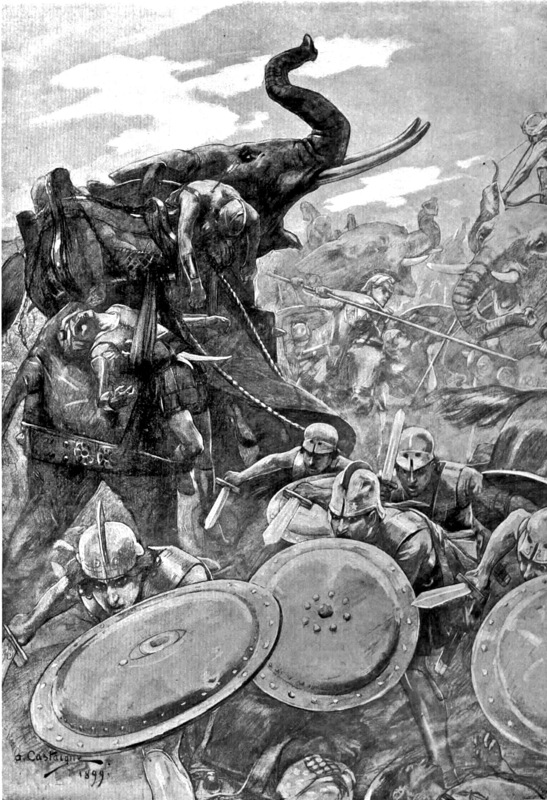 Sambus himself ‘fled with thirty elephants into the country beyond the Indus’. I wonder if he met cousin-Porus out there? As he had done to Sambus’ people, so he did to the Brahmins. The survivors ‘came supplicating [to Alexander] with branches in their hands’. Alexander heard their appeal. Diodorus notes that he punished ‘the most guilty’ (i.e. those who had called for war against him?) and ‘forgave the rest’. First of all, I’d like to go back to yesterday’s post. In it, we read how Dioxippus defeated Coragus in their duel by upending him, and placing his foot on Coragus’ neck. 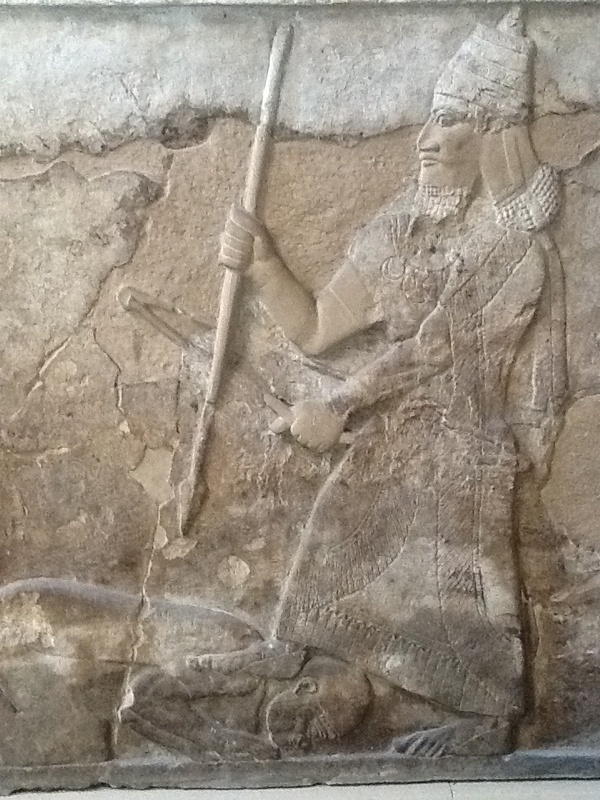 I visited the British Museum yesterday, and while there saw this Assyrian relief. The man standing up is Tiglath-Pileser III; the man submitting to him is Hanunu, the ruler of Gaza. Can you see where Tiglath-Pileser’s foot is? I was a bit surprised to read about the Sambastae’s alarm at the Macedonian ships. They obviously live quite close to the river, don’t they use ships themselves? It occurs to me, though, that perhaps it was the design of the Macedonian vessels that threw them – perhaps even their prows with the images of the gods on front. Citing Arrian, the Footnotes say that this latest Alexandria was built ‘at the junction of the Acesines and the Indus’. I thought we left the Acesines behind when it flowed into the Indus, but obviously not. My picture of the rivers is contained in the third paragraph of this post. As I said above, Diodorus doesn’t say if Alexander fought Musicanus. I’m going to suggest that he did, and that is why he killed him rather than confirm him in his post, like he did numerous other kings who willingly submitted. Porticanus must really have angered Alexander, for not only did Alexander let his men plunder Porticanus’ cities, but he destroyed them and then destroyed all the other settlements in that country. In doing so, Diodorus writes, Alexander ‘spread the terror of his name throughout the whole region’. Sambus’ kingdom gets equally tough treatment. They must have put up fierce resistance to the Macedonians. Making Bactria and Sogdia look easy since 327 B.C.